Farmers living in RW 10 and 09, Kebayoran Lama Selatan Urban Village, Kebayoran Lama, South Jakarta can now harvest strong yields of vegetables.
" Our vegetable is organic and sold to the people via Whatsapp application, shared and processed into vegetable nuggets"
Kebayoran Lama Sub-district's Maritime, Agriculture, and Food Security Executing Unit Head, Yosiah Anis stated that farmers can manage their own farm independently. "They've been able to buy the seeds that they want by utilizing empty land as agricultural land," he expressed, Thursday (1/10). 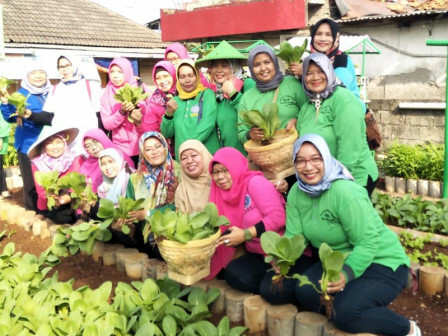 Seruni Indah Women Farmer Group RW 10 Chairwoman, Eka Yulianti said that her group managed to harvest 25 kilograms of pakcoy vegetables, 18 kilograms of water spinach, 17 kilograms of mustard greens, and 17 kilograms of lettuce. "Our vegetable is organic and sold to the people via Whatsapp application, shared and processed into vegetable nuggets," she described. Kebayoran Lama Selatan Urban Village Head, Fachrudin is happy with the harvest results. For the Kemuning Farmer Group RW 09 has harvested 72 kilograms of vegetables. In total there are 12 RWs that already have farmer group. "We always encourage them to use vacant land for agriculture, as it can increase their income," he stated.